The palate is divided anatomically into the hard palate (part of the oral cavity) and the soft palate (part of the oropharynx). Cancer of the soft palate accounts for approximately 2% of head and neck mucosal malignancies. Half of all hard palate cancers are squamous cell carcinomas (SCCs) as seen in the image below. Nonsquamous cell cancers, including minor salivary gland cancers, sarcomas, and melanomas, account for the other half (see the histologic distribution of hard palate malignant neoplasms and the histologic types and frequencies of minor salivary gland neoplasms of the palate, below). Squamous cell carcinoma of the hard palate. However, in the soft palate, 80% of cancers are SCCs. Nonsquamous malignancies account for the other 20%. The prevalence of oral cavity and oropharyngeal cancer has geographic variations, with the highest rate reported in India, accounting for 50% of all cancer cases in that country. Although a strong correlation is established between tobacco and alcohol consumption and SCC of the oral cavity and soft palate, the relationship to hard palate cancer is not as clear. Reverse smoking is a specific etiologic factor for SCC of the hard palate. In reverse smoking, the lit end of the cigarette is placed in the mouth so that an intense heat is generated during smoking. Other factors, including ill-fitting dentures, poor oral hygiene, mechanical irritation, and mouthwash, are implicated in oral cavity SCC; however, the evidence is less convincing. A thorough history and physical examination help to assess the extent of tumor. SCC extension beyond the hard palate occurs in up to 70% of lesions. Posterior extension involves the soft palate, with possible velopharyngeal insufficiency and hypernasal speech. Palatal hypesthesia indicates trigeminal nerve involvement in the sphenopalatine foramen or pterygopalatine fossa extension. An absent corneal reflex is indicative of skull-base extension through the foramen rotundum, foramen ovale, or inferior orbital fissure. Dental numbness may indicate perineural invasion. Middle ear effusion is suggestive of nasopharyngeal extension or invasion of the tensor veli palatini muscle. Involvement of the mandibular division of the trigeminal nerve may manifest as hypesthesia along the mandible or wasting of the temporalis or masseter muscles. This is indicative of infratemporal fossa involvement. Trismus, malocclusion, and pain are symptoms of invasion of the pterygoid muscles. Extension to the gingiva requires assessment. Dental sockets provide a pathway of invasion to the alveolar process of the maxillary bone and into the maxillary sinus. Nasal floor involvement may occur by direct extension through the palate. Lymph node involvement is of special concern in SCC and high-grade mucoepidermoid cancer. It is rare in other salivary gland carcinomas. Approximately 30% of patients have cervical node metastasis at the time of presentation. The submandibular nodes (level I) and upper deep jugular lymph nodes (level II) are the first echelon of nodal drainage. However, in tumors with posterior soft palate extension, retropharyngeal nodes may be involved. Soft palate carcinomas are staged as oropharyngeal cancers according to the American Joint Committee on Cancer (see Staging). Almost half of patients present with extension of the tumor beyond the soft palate. Common sites of extension include the tonsils, retromolar trigone, inferior or superior alveolar process, hard palate, and base of tongue. Extension into the sphenopalatine foramen may result in palatal hypostasis. In extensive lesions extending into the nasopharynx, middle ear effusion is common. The tumor may extend anterosuperiorly into the pterygomaxillary and infratemporal fossa. SCCs of the palate manifest as ulcerative surface lesions. Often, patients are asymptomatic in the early stages, but they may experience pain in advanced stages. A palate mass, bleeding, a foul odor, ill-fitting dentures in edentulous patients, or loose teeth may be the presenting symptoms for patients with hard palate cancer. In persons with advanced-stage soft palate cancers, velopharyngeal insufficiency, altered speech, difficulty swallowing, referred otalgia, trismus, or a neck mass may be present. Because the area is easily visualized, tumors are often found at early stages incidentally by the patient or the physician. On the other hand, minor salivary gland tumors manifest as submucosal lesions, as depicted in the image below, with a smooth, normal mucosal covering. Melanomas are smooth, black lesions but may be brown or brownish gray. Kaposi sarcomas are bluish lesions that are commonly seen in patients with HIV infection. 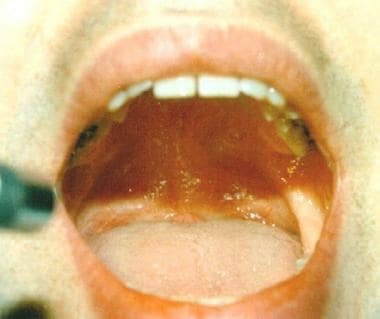 Thirty-two-year-old man with a submucosal lesion at the junction of the hard and soft palate. Pseudoepitheliomatous hyperplasia and necrotizing sialometaplasia are benign self-limited lesions that can mimic SCC and need to be distinguished histologically. Torus palatina (ie, bony hyperplasia of the palate) are hard midline masses that produce no symptoms and should not be confused with tumors. The palate separates the oral cavity from the nasal cavity and the maxillary sinuses. The mucosa of the palate is a keratinizing pseudostratified squamous epithelium. However, the submucosa has numerous minor salivary glands, especially in the hard palate. The periosteal covering of the hard palate becomes a relative barrier to the spread of cancer into the palatine bone. The neurovascular supply to the palate comes from the palatine foramina, located medial to the third molar teeth. These foramina provide a pathway for the tumor to spread. Descending palatine arteries from the internal maxillary artery provide the blood supply. Vessels pass anteriorly through the nasopalatine foramen to the nose. Sensory and secretomotor fibers from the maxillary (V-II) branch of the trigeminal nerve and pterygopalatine ganglion traverse to the hard palate via the greater and lesser palatine nerves. Anatomically, the soft palate is part of the oropharynx. It consists of mucosa on both surfaces. Intervening between the 2 mucosal surfaces are the connective tissue, muscle fibers, aponeurosis, numerous blood vessels, lymphatics, and minor salivary glands. Functionally, the soft palate serves to separate the oropharynx from the nasopharynx during swallowing and speech. The soft palate approximates with the posterior pharyngeal wall during swallowing to prevent nasopharyngeal regurgitation and approximates during speech to prevent air escape into the nose. Contraindications to surgical correction of malignant palate tumors are based on the patient's comorbidities and his or her ability to tolerate surgery. Coexisting medical conditions may put the patient at risk during anesthesia. Additionally, tumors may be deemed inoperable because of their size or extent of involvement. Tumors that have intracranial extension are considered inoperable if they involve the brain parenchyma. Radiation therapy is a treatment option in these rare cases. See the Treatment section for recommended treatments for various types and stages of palate cancer. Yang Z, Deng R, Sun G, Huang X, Tang E. Cervical metastases from squamous cell carcinoma of hard palate and maxillary alveolus: A retrospective study of 10 years. Head Neck. 2013 Jun 4. [Medline]. Zhurakivska K, Maiorano E, Nocini R, et al. Necrotizing sialometaplasia can hide the presence of salivary gland tumors: a case series. Oral Dis. 2019 May. 25 (4):1084-90. [Medline]. Ju WT, Zhao TC, Liu Y, et al. Computed tomographic features of adenoid cystic carcinoma in the palate. Cancer Imaging. 2019 Jan 31. 19 (1):3. [Medline]. [Full Text]. Zheng Y, Xiao Z, Zhang H, et al. Differentiation between benign and malignant palatal tumors using conventional MRI: a retrospective analysis of 130 cases. Oral Surg Oral Med Oral Pathol Oral Radiol. 2018 Apr. 125 (4):343-350. [Medline]. [Full Text]. Rodriguez-Bruno K, Ali MJ, Wang SJ. Role of panendoscopy to identify synchronous second primary malignancies in patients with oral cavity and oropharyngeal squamous cell carcinoma. Head Neck. 2011 Jul. 33(7):949-53. [Medline]. Stassen L, Khosa AD, Israr M. The value of the 'buccal pad of fat' in the reconstruction of oral defects following removal of intraoral tumours--a clinical assessment. Ir Med J. 2013 Jan. 106(1):13-5. [Medline]. Simental AA Jr, Johnson JT, Myers EN. Cervical metastasis from squamous cell carcinoma of the maxillary alveolus and hard palate. Laryngoscope. 2006 Sep. 116(9):1682-4. [Medline]. Sanchez-Fernandez JM, Santaolalla-Montoya F, Sanchez-del Rey A, et al. In reference to: "Cervical metastasis from squamous cell carcinoma of the maxillary alveolus and hard palate.". Laryngoscope. 2007 Mar. 117(3):565-6; author reply 566. [Medline]. Givi B, Eskander A, Awad MI, et al. Impact of elective neck dissection on the outcome of oral squamous cell carcinomas arising in the maxillary alveolus and hard palate. Head Neck. 2016 Apr. 38 Suppl 1:E1688-94. [Medline]. Genden EM, Wallace DI, Okay D, et al. Reconstruction of the hard palate using the radial forearm free flap: indications and outcomes. Head Neck. 2004 Sep. 26(9):808-14. [Medline]. Yamamoto Y, Kawashima K, Sugihara T, et al. Surgical management of maxillectomy defects based on the concept of buttress reconstruction. Head Neck. 2004 Mar. 26(3):247-56. [Medline]. Kader HA, Mydin AR, Wilson M, et al. Treatment outcomes of locally advanced oropharyngeal cancer: a comparison between combined modality radio-chemotherapy and two variants of single modality altered fractionation radiotherapy. Int J Radiat Oncol Biol Phys. 2011 Jul 15. 80(4):1030-6. [Medline]. Ye W, Song Y, Ying B, et al. Use of the buccal fat pad in the immediate reconstruction of palatal defects related to cancer surgery with postoperative radiation therapy. J Oral Maxillofac Surg. 2014 Dec. 72(12):2613-20. [Medline]. Eskander A, Givi B, Gullane PJ, Irish J, Brown D, Gilbert RW, et al. Outcome predictors in squamous cell carcinoma of the maxillary alveolus and hard palate. Laryngoscope. 2013 Apr 1. [Medline]. Yang X, Song X, Chu W, et al. Clinicopathological Characteristics and Outcome Predictors in Squamous Cell Carcinoma of the Maxillary Gingiva and Hard Palate. J Oral Maxillofac Surg. 2015 Jan 10. [Medline]. Tabrizi R, Aliabadi E, Maleki MJ, Barouj MD. Association between clinical features, treatment, and recurrence rate of adenoid cystic carcinoma of the palate: a 10-year retrospective study. Br J Oral Maxillofac Surg. 2016 Jul. 54 (6):648-51. [Medline]. Coronal CT scan revealing intranasal extension of the tumor. Sagittal MRI revealing a mass confined to the palate, without sinonasal extension. Transoral resection of a mucoepidermoid carcinoma of the palate. Schematic per-oral approach to the palate using a Dingman mouth retractor.